Militarization of police refers to the use of military equipment and tactics by law enforcement officers. This includes the use of armored personnel carriers, assault rifles, submachine guns, flashbang grenades, grenade launchers, sniper rifles, and Special Weapons and Tactics (SWAT) teams. The militarization of law enforcement is also associated with intelligence agency-style information gathering aimed at the public and political activists, and a more aggressive style of law enforcement. Criminal justice professor Peter Kraska has defined militarization of police as "the process whereby civilian police increasingly draw from, and pattern themselves around, the tenets of militarism and the military model." Observers have noted the militarizing of the policing of protests. Since the 1970s, riot police have fired at protesters using guns with rubber bullets or plastic bullets. Tear gas, which was developed by the United States Army for riot control in 1919, was widely used against protesters in the 2000s. The use of tear gas in warfare is prohibited by various international treaties that most states have signed; however, its law enforcement or military use for domestic or non-combat situations is permitted. Concerns about the militarization of police have been raised by both ends of the political spectrum in the United States, with both the right-of-center/libertarian Cato Institute and the American Civil Liberties Union voicing criticisms of the practice. The Fraternal Order of Police has spoken out in favor of equipping law enforcement officers with military equipment, on the grounds that it increases the officers' safety and enables them to protect members of the public and other first responders (e.g., firefighters and emergency medical services personnel). However, a 2017 study showed that police forces which received military equipment were more likely to have violent encounters with the public, regardless of local crime rates. Canadian legal expert Michael Spratt wrote, "... there's no question that Canadian police sometimes look more like post-apocalyptic military mercenaries than protectors of the peace. Our police services have been acquiring more and more military toys — a dangerous trend that's gotten little in the way of critical analysis in the mainstream media." Growing numbers of Canadian police agencies have acquired armored vehicles in recent years. In 2010 the Ottawa Police Service bought a Lenco G3 BearCat armored personnel carrier for $340,000, which has "half-inch-thick military steel armoured bodywork, .50 caliber-rated ballistic glass, blast-resistant floors, custom-designed gun ports and ... a roof turret." The G20 protests in Toronto in 2010 showed that the militarization of protest policing is not only occurring in the United States. Police in Toronto used a sound cannon, or Long Range Acoustic Device (LRAD) -- a weapon that was developed for use in conflicts in the Middle East, as well as barricades, pre-emptive arrests and riot units. According to Kevin Walby, an assistant professor of criminal justice at the University of Winnipeg, "the more interesting aspect of the militarization of the police is actually on the strategy side"; police are "increasingly training with military-style tacticians, especially when it comes to situations like crowd control and, increasingly, surveillance." On June 3, 2015 it was reported that "RCMP officers have started openly carrying MP5 submachine guns on Parliament Hill as part of a visible increase to Parliament Hill security following last October's terrorist attack" in 2014. Conservative senator Vern White, a former RCMP officer and a former Ottawa police chief states that "...some RCMP officers guarding Parliament Hill against potential terrorist attacks should be armed with rifles similar to those carried by Canadian troops in Afghanistan [,]" the "...more powerful Colt C8 [which is] popular with police tactical teams and Canadian and other NATO alliance troops." White argues that the C8 carbines would give officers a much longer shooting range than the short-barreled MP5 submachine guns. "The RCMP is issuing more than 2,200 C8 carbines to its officers [,]" but the RCMP has not indicated whether the C8s will be issued to Parliament Hill officers. The use of surplus armored vehicles for use by the RCMP and other police forces throughout the country are challenged by lawyers and academics since they can easily send the wrong message to the public. According to Michael Spratt, an Ottawa-based criminal lawyer, the funds used to acquire the vehicles is better used for crime prevention activities. In 2013 "...Brazil saw countrywide demonstrations protesting a lack of basic services while the country was spending billions on the World Cup and the Olympics. The unprepared and overreacting police forces responded in a way that shocked the largely middle-class protesters. The police, using "non-lethal" weapons like pepper spray and rubber bullets while dressed from head to toe in ninja-like full battle gear, indiscriminately arrested both violent "black bloc" demonstrators, known for their confrontational tactics and anarchist views, along with non-violent protestors marching peacefully." As a result, "...calls for de-militarization of the police—from social movements, non-governmental organizations, and even segments of the police itself—became widespread and remain one of the legacies of the World Cup." The Brazilian "...Military Police today, while not officially a wing of the Armed Forces, remains an institution with a strict military hierarchy, training that retains a military ideology, and practices that frequently resemble occupying forces conquering enemy territories." The units that responded to the protests were Shock Police, units specialized in riot control. The Military Police is an ancillary and reserve force of the Army, under the General Inspectorate of Military Police, being that a part of Land Operations Command. But, in time of peace, the state governor act as commander-in-chief of the Police and Firefighting Corps, according to the Constitution of Brazil, article 144, 6th paragraph, where it is said that the "Military Police and Firefighter Corps, ancillary and reserve forces of the Army, subordinate themselves, with the Civil Police, to the state and Federal District governors." "Since 1999, an eight-billion-dollar programme in Colombia has seen "the mass deployment of military troops and militarized police forces to both interdict illegal drugs and counter left-wing guerrilla groups". This assistance "promote[s] militarization to address organized crime". Due to these U.S. policies, "civilian forces ... have increasingly received military training, leading to concerns over human rights violations and excessive use of force, as well as a lack of knowledge over how to deal with local protests – concerns startlingly similar to those now coming out of Ferguson, Missouri." In 2016, the German police introduced a "new special unit, BFE+", which is designed to "counter terror attacks." Criminologist Rafael Behr states that the new BFE+ [de] "mainly serves as a psychological reassurance for the public", serving as a "symbolic" effort and a functional effort. The functional aspect is that with the BFE+, the government can use armed forces with military weapons inside Germany, an act that is "currently banned by the German constitution". The 250 person BFE+ will be added to the existing GSG-9 unit. Behr states that the BFE+ will be able to "launch large-scale manhunts", using an "end of the policing spectrum" which "borders on war-like or military action." Mexico's new national police force, the Gendarmería, is partially staffed with active duty soldiers, part of a longstanding trend towards militarization of the country's Federal Police. 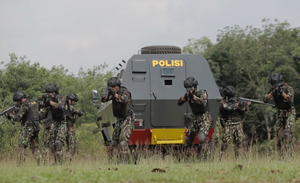 The Mobile Brigade Corps (Brimob) is an Indonesian militarized police force (Paramilitary) which are often deployed for Riot control, SWAT operations, anti-terror, domestic guerrilla warfare, domestic civil hostage rescue, search and rescue, and armed conflict management especially in areas with domestic conflict, such as in Papua and Poso. It usually conducts joint operations with the TNI. Following the Reconstruction Era (1865–1877) in the aftermath of the American Civil War (1861–1865), Congress passed the 1878 Posse Comitatus Act, in response to the allegation of civil liberties abuse under military occupation of the former Confederate States by members of the United States military during Reconstruction. Still in force, the law prohibits the United States Army and the United States Air Force (as amended in 1956) for being used as domestic law enforcement except when authorized by the President under certain circumstances; similar limitation also applies to the United States Marine Corps and the United States Navy by Department of the Navy policy. The Act does not apply to the National Guard and state defense forces while under the authority of their respective state governors nor the United States Coast Guard, which is both an armed service and a maritime law enforcement agency and is not under authority of the United States Department of Defense (which was formed in 1947 out of the United States Department of War). After the law was passed, it allowed state and local authorities to regain control of their affairs, with their police departments typically equipped with handguns, shotguns, and batons, which were suitable for law enforcement purposes. Throughout the 20th century, the United States has faced large and heavily armed criminal organizations, in which law enforcement officers were clearly outperformed. In the 1920s during the Prohibition Era and in the early 1930s during the Great Depression, criminal syndicates and individual bank robbers such as John Dillinger and Bonnie and Clyde were frequently armed with Thompson submachine guns and Browning Automatic Rifles. 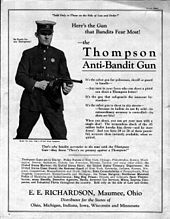 The Federal Bureau of Investigation (FBI), as well as police departments in cities such as Kansas City, Missouri and Kenosha, Wisconsin, began deploying automatic weapons, including the Thompson submachine gun, and armored cars in the 1920s and 1930s. An FBI officer firing a Browning Automatic Rifle in 1936. George Fletcher Chandler, a veteran of the Pancho Villa Expedition and the first Superintendent of the New York State Police, was an early advocate of law enforcement officers wearing their weapons exposed on the outside of their uniforms. During the late 1920s through the early 1930s, gunmen from criminal gangs in the United States began wearing bulletproof vests made from thick layers of cotton padding and cloth. These early vests could absorb the impact of handgun rounds such as .22 Long Rifle, .25 ACP, .32 S&W Long, .32 S&W, .380 ACP, .38 Special and .45 ACP traveling at speeds of up to 300 m/s (980 ft/s). To overcome these vests, law enforcement agents such as the FBI began using the newer and more powerful .38 Super, and later the .357 Magnum cartridge. Experts believes that police militarization was escalated in the 1950s and 1960s, an era in which race riots were common in many U.S. cities. Some believe that the seeming success of officers armed with military-style weapons and deployed to curtail the 1965 Watts Riots, a six-day race riot sparked by conflicts with the Los Angeles Police Department (LAPD) that killed 34 people, gave way to the trend of arming and equipping law enforcement officers with battlefield weapons. Joy Rohde, a professor at the University of Michigan's Ford School of Public Policy, has published research indicating that "militarization is a mindset ... is a tendency to see the world through the lens of national security, a tendency to exaggerate existing threats." Rohde traces "the origins of modern militarized policing" to the Cold War-era anti-communist paranoia, and the idea that domestic civil rights activists were similar to foreign enemies, as manifested in activities such as the CIA's Operation CHAOS. Things have changed over the last 100 years and due to the rise of acts of terrorism and the easy access to high-powered weapons; special weapons and tactics teams have been implemented and are being utilized across the nation. The 1960s to 1990s, encounters with the sophisticated weapons of narcotics trafficking groups such as the Medellín Cartel and street gangs such as the Gangster Disciples, with organized, violent left-wing protesters at such events as the 1968 Democratic National Convention in Chicago and the 1999 WTO Conference in Seattle, with urban riots such as the 1965 Watts riots in Los Angeles and the 1967 Detroit Riot in Detroit led law enforcement to reconsider their standard side arms. As well, law enforcement experience with arsonists such as Earth Liberation Front (ELF), with mass shootings and/or shootouts such as the 1984 McDonald's massacre in San Ysidro and the 1986 shootout between eight FBI agents and two serial bank robbers in Miami (in which the agents were out-gunned by the robbers) and with explosive devices used by the Weather Underground, Timothy McVeigh, and Ted Kaczynski (the "Unabomber"), highlighted the inadequacy of many law enforcement agencies' weapons and tactics. Researchers David N. Falcone, Edward L. Wells, and Ralph A. Weisheit describe a historical separation of police models between small towns and larger cities, which tended to function differently with separate hierarchical systems supporting each. The militarization of both rural and urban law enforcement has been attributed to the United States' involvement in wars during the 20th century, and to increasingly frequent encounters with violent protesters and criminals with automatic weapons, explosives, and body armor, although some attribute the militarization to the more recent campaigns known as the War on Drugs and the War on Terror. Historian Charles A. Beard argues that cultural change during the Great Depression encouraged the militarization of law enforcement, whereas Harwood argues that the creation of SWAT teams and tactical units within law enforcement during the 1960s began such trend. The 1981 Military Cooperation with Civilian Law Enforcement Agencies Act allows the U.S. military to cooperate with domestic and foreign law enforcement agencies. Operations in support of law enforcement include assistance in counter-drug operations, assistance for civil disturbances, special security operations, counter-terrorism, explosive ordnance disposal (EOD), and similar activities. Constitutional and statutory restrictions and corresponding directives and regulations limit the type of support provided in this area. This allows the U.S. military to give law enforcement agencies access to its military bases and its military equipment. The legislation was promoted during the Presidency of Ronald Reagan in the context of the War on drugs, and is considered a part of a general trend towards the militarization of police. The Act is cited in the 1992 essay The Origins of the American Military Coup of 2012 as having set a precedent that the author, a United States Air Force officer, considered dangerous. The 1997 North Hollywood shootout had a profound effect on law enforcement agencies. Local patrol officers at the time were typically armed with their standard issue 9×19mm or .38 Special pistols, with some having a 12-gauge shotgun available in their cars. The North Hollywood bank robbers carried fully automatic AK-47-style weapons with high capacity drum magazines and ammunition capable of penetrating vehicles and police Kevlar vests. With these weapons, two bank robbers fired approximately 1,100 rounds at officers and civilians before being killed. The robbers wore body armor which successfully protected them from bullets and shotgun pellets fired by the responding patrolmen. Police noted that the service pistols carried by the first responding officers had insufficient range and relatively poor accuracy, although a SWAT team eventually arrived with sufficient firepower. The ineffectiveness of the standard police patrol pistols and shotguns in penetrating the robbers' body armor led to a trend in the United States toward arming selected police officers, not just SWAT teams, with heavier firepower such as semi-automatic 5.56×45mm NATO AR-15 type rifles. SWAT teams, whose close quarters battle weaponry usually consisted of submachine guns that fired pistol cartridges such as the Heckler & Koch MP5, began supplementing them with AR-15 type rifles and carbines. Seven months after the incident, the Department of Defense gave 600 surplus M16s to the LAPD, which were issued to each patrol sergeant; LAPD patrol vehicles now carry AR-15s as standard issue, with bullet-resistant Kevlar plating in their doors as well. [full citation needed] As a result of this incident, the LAPD authorized its officers to carry .45 ACP caliber semiautomatic pistols as duty sidearms, specifically the Smith & Wesson Models 4506 and 4566. Prior to 1997, only LAPD SWAT officers were authorized to carry .45 ACP caliber pistols, specifically the Model 1911A1 .45 ACP semiautomatic pistol. The 1033 program was created by the National Defense Authorization Act of Fiscal Year 1997 as part of the U.S. Government's Defense Logistics Agency Disposition Services (DLA) to transfer excess military equipment to law enforcement agencies. As of 2014[update], 8,000 local law enforcement agencies participate in the reutilization program that has transferred $5.1 billion in military hardware from the United States Department of Defense to local American law enforcement agencies since 1997. Police departments have obtained surplus aircraft, bayonets, tactical armored vehicles, weapons, including grenade launchers, and watercraft. Under the Fourth Amendment, law enforcement officers must receive written permission from a court of law, or otherwise qualified magistrate, to lawfully search and seize evidence while investigating criminal activity. Following the September 11 attacks, the 2001 Patriot Act gave law enforcement officers permission to search a home or business without the owner's or the occupant's consent or knowledge, amongst other provisions, if terrorist activities were suspected. The Act was criticized for its perceived violation of civil liberties and has generated a great deal of controversy since its enactment. In United States v. Antoine Jones, the court found that increased monitoring of suspects caused by the Patriot Act directly put the suspects' constitutional rights in jeopardy. For a time, the Act allowed for agents to undertake "sneak and peek" searches. Critics such as the ACLU strongly criticized the law for violating the Fourth Amendment. On May 18, 2015, President Barack Obama announced limits on the types of military equipment which can be transferred to police departments and the implementation of training programs to assure the appropriate use of other items. The military can no longer transfer some weapons, such as grenade launchers, weaponized vehicles, and bayonets to police. Obama stated that "We've seen how militarized gear can sometimes give people a feeling like it's an occupying force as opposed to a force that's part of the community that's protecting them and serving them, ... So we're going to prohibit equipment made for the battlefield that is not appropriate for local police departments." In response to Obama's announcement, the United States' largest police union, the Fraternal Order of Police, reacted negatively, pledging to push back against the new restrictions, and accusing the administration of politicizing officers' safety. The executive director of the FOP, James Pasco, stated that his group "...(would) be at (their) most aggressive in asserting the need for officer safety and officer rights in any police changes that are to be effected", and objected to a requirement that would require police departments to obtain permission from city governments to acquire certain equipment, including riot batons, helmets and shields, through federal programs. Pasco stated "We need to only look back to Baltimore (the location of the 2015 protests following the death of Freddie Gray) to see what happens when officers are sent out ill-equipped in a disturbance situation ... [;] Because you don't like the optics (of militarization), you can't send police officers out to be hurt or killed." In July 2016, the Obama Administration announced that it would revisit the 2015 ban on some types of military equipment for police forces, and begin a process of case-by-case review. On August 28, 2017 U.S. Attorney General Jeff Sessions announced the lifting of restrictions on the transfer of military equipment to law enforcement agencies. Sessions said during his announcement that the Trump administration would not "put superficial concerns above public safety". Some prominent Americans have argued that police militarization is required to respond to an alleged "war on police" that exists in the U.S.: Texas Lt. Gov. Dan Patrick stated "There's A War On Cops", New York Police Chief Bratton warned of a "war on cops" and similar statements have been made by Donald Trump, Ted Cruz, and Scott Walker. Radley Balko calls these claims "fact-free fear mongering"; he states that "...2015 is on pace to see 35 felonious killings of police officers. If that pace holds, this year would end with the second lowest number of murdered cops in decades." as well as "...not only are fewer people killing police officers, fewer people are trying to harm them." On Monday, May 13, 1985, Philadelphia police attempted to clear a building occupied by MOVE black liberation activists and execute arrest warrants. This led to an armed standoff with police, who lobbed tear gas canisters at the building. The police said that MOVE members fired at them; a gunfight with semi-automatic and automatic firearms ensued. Commissioner Sambor ordered that the compound be bombed. From a Pennsylvania State Police helicopter, Philadelphia Police Lt. Frank Powell proceeded to drop two one-pound bombs (which the police referred to as "entry devices") made of FBI-supplied water gel explosive, a dynamite substitute, targeting a fortified, bunker-like cubicle on the roof of the house. The resulting explosions ignited a fire which spread and eventually destroyed approximately 65 nearby houses. Eleven people (John Africa, five other adults, and five children aged 7 to 13) died in the resulting fire, and more than 250 people in the neighborhood were left homeless. Ramona Africa, one of the two survivors, said that police fired at those trying to escape. In 1992, there was a deadly confrontation and a 12-day siege at Ruby Ridge in northern Idaho between Randy Weaver, his family and his friend Kevin Harris, and agents of the United States Marshals Service (USMS) and Federal Bureau of Investigation (FBI). USMS and FBI agents were armed with M16s and sniper rifles, and they used an armored personnel carrier. It resulted in the deaths of two Weaver's son Sammy, his wife Vicki, and Deputy U.S. Marshal William Francis Degan. At the subsequent federal criminal trial of Weaver and Harris, Weaver's attorney Gerry Spence made accusations of "criminal wrongdoing" against every agency involved in the incident: the FBI, USMS, the Bureau of Alcohol, Tobacco, Firearms and Explosives (BATFE), and the United States Attorney's Office (USAO) for Idaho. At the completion of the trial, the Department of Justice's Office of Professional Responsibility formed a Ruby Ridge Task Force to investigate Spence's charges. The 1994 Task Force report was released in redacted form by Lexis Counsel Connect and raised questions about the conduct and policy of all the agencies. Public outcry over Ruby Ridge led to the Senate Subcommittee on Terrorism, Technology and Government Information holding 14 days of hearings and issuing a report calling for reforms in federal law enforcement to prevent a repeat of Ruby Ridge and to restore public confidence in federal law enforcement. In 1993, FBI and BATFE agents used armored vehicles and tanks and attack helicopters during the siege of the Branch Davidian community in Waco, Texas. The FBI's arms included .50 caliber (12.7 mm) rifles and M728 Combat Engineer Vehicles, which are based on an M60A1 Patton main battle tank chassis. The FBI also launched 40-millimetre (1.6 in) CS grenade fire from M79 grenade launchers and fired two military M651 rounds at the Branch Davidian site. 40mm munitions recovered by the Texas Rangers at Waco included dozens of plastic Ferret Model SGA-400 Liquid CS rounds, two metal M651 military pyrotechnic tear gas rounds, two metal NICO Pyrotechnik Sound & Flash grenades, and parachute illumination flares. The Army Tech Manual for the M651 warns that it can penetrate 3/4" plywood at 200 meters and the "projectile may explode upon target impact." In 2005, the Maryland State Police (MSP) began entering the names and personal information of death penalty opponents and anti-war protesters into a database used to track terrorists. In the aftermath of Hurricane Katrina in New Orleans in 2005, employees of the private security firm Blackwater patrolled the city with automatic weapons. "When asked what authority they were operating under," journalist Jeremy Scahill reported, "one guy said, 'We're on contract with the Department of Homeland Security.'" Local news station WDSU mentioned reports of police officers claiming to have summarily executed looters. On August 25, 2008, the Denver Police Department (DPD) were accused of making mass, indiscriminate arrests of almost 100 protesters at the Democratic National Convention. In 2011, the city of Denver, Colorado agreed to pay a $200,000 settlement and to improve its crowd control training and policies. In February 2010, the Minneapolis Police Department (MPD) raided the apartment of Rickia Russell, breaching the door and throwing in a flashbang grenade, as part of a search for drugs. At the time, Russell was eating dinner with her boyfriend and the exploding grenade gave her burns to her head and calves. No drugs were found in Russell's apartment and the Minneapolis City Council agreed to pay $1 million in damages. In January 2011, Rogelio Serrato in Greenfield, California, died of smoke inhalation after a flashbang grenade launched by the SWAT team of the Greenfield Police Department (GPD) ignited a fire in his home. In May 2011, the Pima County Sheriff's department killed Marine and Iraq war veteran Jose Guerena, when they entered his home while serving a search warrant related to a marijuana smuggling investigation. They fired 71 shots into his home, while his wife and 4-year-old child were inside, and found no drugs nor anything illegal. The departments involved paid a $3.4 million settlement. 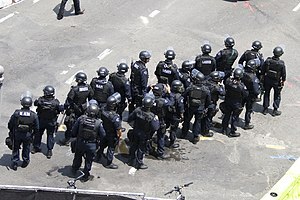 Referring to the 2011 Occupy Wall Street protests in New York City, Glen Greenwald wrote, "The police response was so excessive, and so clearly modeled after battlefield tactics, that there was no doubt that deterring domestic dissent is one of the primary aims of police militarization." The Oakland Police Department (OPD) used excessive force while breaking up Occupy Oakland demonstrations in 2011. Several protesters successfully sued the city of Oakland, California for their injuries; Scott Olsen was severely injured after being hit in the head with a police projectile and was awarded $4.5 million. The city paid $1.17 million to a group of protesters, and $645,000 to Kayvan Sabeghi, who was clubbed by police. A police sniper with a sniper system provides overwatch at the Ferguson protest regarding the shooting of Michael Brown. On May 28, 2014, a SWAT team looking for drugs in a Cornelia, Georgia home threw a flashbang grenade into the house. The grenade landed in the playpen of a 19-month-old baby boy, and the detonation severely burned and mutilated the baby's face. In late 2014, concerns about the militarization of police arose after the shooting of Michael Brown occurred on August 9, 2014, in Ferguson, Missouri, a suburb of St. Louis. The display of military gear by area police agencies dealing with the protests received significant criticism from the media and politicians. There were concerns over insensitivity, tactics and a militarized response. In recent years, the use of military equipment and tactics for community policing and for public order policing has become more widespread. Lawmakers have begun to discuss the topic. The drift toward militarization concerns police officers and police policy analysts themselves. U.S. community policing grew out of the Peelian Principles of the London Metropolitan Police which emphasizes the relationship between the police and the community they serve. Police academy education patterned after a military boot camp, military-type battle dress uniforms and black color by itself may produce aggression, as do the missions named wars on crime, on drugs, and on terrorism. In a 2013 piece in the newsletter of the DOJ's Office of Community Oriented Policing Services (COPS), COPS Senior Policy Analyst Karl Bickel warned that police militarization could seriously impair community-oriented policing. Bickel wrote that accelerating militarization was likely to alienate police relationship with the community, and pointed to a variety of factors that contribute to militarization, including the growth of SWAT; the increase prevalence of dark-colored military-style battle dress uniforms for patrol officers (which research suggests has a psychological effect of increasing aggression in the wearer), and "warrior-like" stress training in policing training, which fosters an "us versus them" approach. A report by The Marshall Project looking at data from the early 2010s investigated the mindset of "guardian" versus "warrior" by calculating the rate of complaints for excessive use of force against police officers who had served in the military versus police officers in general. It found higher rates for veterans in Boston (28% vs. 17%) and Miami (14% vs. 11%), but found no difference for Massachusetts State Police. A national survey in August 2016 by the Pew Research Center found police officers who had served in the military were more likely to have fired their weapon while doing police work (32% vs. 26%). The ACLU has stated that local police use these "wartime weapons in everyday policing, especially to fight the wasteful and failed drug war, which has unfairly targeted people of color." Travis Irvine from The Huffington Post referred to how "local police forces now roll tank-like vehicles through our streets." Dave Pruett from The Huffington Post raised concerns about "Military Humvees, still in camouflage and mounted with machine guns, in the hands of municipal police [and] SWAT teams of police in full riot gear, bristling with automatic weapons." Former "...Seattle Police Chief Norm Stamper published an essay arguing that the current epidemic of police brutality is a reflection of the militarization ... of our urban police forces, the result of years of the "war on drugs" and the "war on terror." Senator Rand Paul has proposed a demilitarization of U.S. police departments, stating that "The images and scenes we continue to see in Ferguson resemble war more than traditional police action." Chuck Canterbury, the president of the Fraternal Order of Police, argued that the equipment received from the federal government had been properly de-militarized, and that it was being used to protect civilians from violent crime. He further stated that the use of the equipment by law enforcement was necessary to protect civilians, since mass shootings have taken place across the United States, even in small towns. Responding to claims that law enforcement officers were being given tanks, Canterbury argued that the vehicles being used by law enforcement were not armed, and that they were being used across the United States to protect other officers. On March 23, 2015, a Department of Justice investigation into use of deadly force by the Philadelphia Police Department in the period from 2007-2013 found that the way officers are trained may be a contributing factor to excessive use of deadly force. The report found that a) many officers have the mistaken assumption that being "in fear of their life" is justification for the use of deadly force, but fear should not be a factor - it's a reasonable belief that deadly force is necessary to avoid death or serious injury; b) instruction about policies on the use of force is confusing; c) most training scenarios end in some type of use of force and officers are rarely, if ever, trained how to resolve confrontations peacefully; d) 80% of suspects shot by police were black - black suspects were also more than twice as likely to be shot due to a "threat perception failure"; and e) no consistent procedure was in place for shooting investigations, no audio or video recordings of officer interviews were being made, and officers are often interviewed months after the incidents. In a report released in June 2015, Amnesty International alleged that the United States does not comply with the UN Basic Principles on the Use of Force and Firearms by Law Enforcement Officials. In a January 2017 report Cato Institute criminal justice policy analyst Adam Bates argues that in the United States, "an increasingly militarized domestic police force" is characterized by "mission creep [that] has not been limited to weapons and tactics. What the War on Drugs has done for police militarization, the War on Terror is now doing for police intelligence gathering, and the privacy of millions of Americans is at risk." The American Civil Liberties Union has raised concerns about military involvement in surveillance of peaceful protesters. The ACLU pointed, for example, to U.S. Department of Defense (DOD) issuance of Threat and Local Observation Notices (TALON) depicting Veterans for Peace and other anti-war groups as "terrorist threats." The ACLU also raised concerns about military involvement in "fusion centers." The federal Posse Comitatus Act of 1878 forbids the U.S. military from conducting domestic law enforcement activities, embodying "the traditional American principle of separating civilian and military authority." There have been exceptions made, however: in 1981, Congress enacted legislation allowing military involvement in drug interdiction at U.S. borders, and eight years later "designated the Department of Defense as the 'single lead agency' in drug interdiction efforts." In the late 1990s, following the Oklahoma City bombing, there were proposals to further limit the act to allow military participation in law enforcement activities in chemical/biological weapon and terrorism cases. These anti-terrorism proposals were criticized by some commentators on the basis that they were a threat to civil liberties. Writers such as U.S. Air Force officer Charles J. Dunlap, Jr. critiqued proposals to use the military for internal security, on the basis that "No one should suffer the illusion that military forces could ever execute the laws with the same sensitivity to civil liberties as regular police forces." Dunlap argued that "the central imperatives of military service" was "destroying targets and undermining enemy command and control"—a skill that did not necessary carry over into intelligence-gathering and investigation. Under this view, "a successful policization of the armed forces may well render it incapable of defeating authentic external military threats." The accelerating militarization of regular law enforcement during the War on Drugs and post-September 11 War on Terror, however, prompted some commentators to express alarm at the blurring of the distinction between civil and military functions, and the potential to erode constraints on governmental power in times of perceived crisis. A 2010 paper published in the journal Armed Forces & Society examined "role convergence, that is, evidence that significant segments of police operations in the United States have taken on military characteristics; and evidence indicating that many U.S. military initiatives have taken on policing characteristics." It concluded that "for individual citizens and for society as a whole, at least one aspect of role convergence—the militarization of the police—is potentially troublesome. If this convergence results in the police adopting not only military-type tactics and procedures but also military attitudes and orientations, the convergence may seriously threaten traditional civil rights and liberties." A 2014 report by the American Civil Liberties Union, War Comes Home: The Excessive Militarization of American Policing, concluded that "American policing has become unnecessarily and dangerously militarized ...," citing an increase in the use in unnecessarily aggressive SWAT raids, "tactics designed for the battlefield"; and military equipment such as armored personnel carriers, flashbang grenades, and battering rams, as well as a lack of transparency and oversight. Writers such as Ilya Shapiro and Randal John Meyer have argued that militarization leads to "extreme constitutional violations." Peter Kraska, a criminal justice professor at Eastern Kentucky University, found that the prevalence of SWAT teams, among police agencies serving populations of at least 50,000 people, doubled from the mid-1980s to the late-1990s, rising to 89% of police agencies by the end of this time period. Among smaller police agencies (covering areas with between 25,000 and 50,000 people), the proportion with SWAT teams rose from 20% in the mid-198-s to 80% in the mid-2000s. Kraska states that: "When people refer to the militarization of police, it's not in a pejorative or judgmental sense.Contemporary police agencies have moved significantly along a continuum culturally, materially, operationally, while using a Navy SEALs model. All of those are clear indications that they're moving away from a civilian model of policing." A 2014 ACLU report, War Comes Home: The Excessive Militarization of American Policing, concluded that "American policing has become unnecessarily and dangerously militarized ..." The report examined 818 uses of SWAT teams by more than 20 law enforcement agencies in 11 U.S. states from the period of July 2010 to October 2013. Military-style tactics used by such teams include nighttime raids, use of battering rams, use of flashbangs, overwhelming displays of force, and the wearing of helmets and masks. 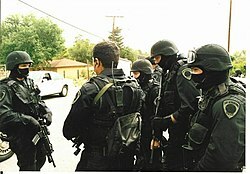 The use of SWAT teams became especially common for drug searches. The ACLU study found that 62% of SWAT deployments were for drug raids, and that 79% involved raids on private homes; the study found that only "7% fell into those categories for which the technique was originally intended, such as hostage situations or barricades." In some cases, civilians, including infants, were killed or injured due to police use of force in military style raids. In other cases, residents of affected neighborhoods reported experiencing psychological trauma as a result of militaristic law-enforcement tactics. The use of force and military-style equipment during such raids prompted criticism, particularly from civil libertarians such as Radley Balko, who wrote on the topic in his book Rise of the Warrior Cop: The Militarization of America's Police Forces. The Chicago Police Department (CPD) have been accused of operating a secret "black site" in Homan Square where suspects were held without being booked and registered and where they could not be found by their attorneys or families. Suspects were allegedly shackled and beaten. From 1997 to 2016, the United States Department of Justice (DOJ) has gone to court to challenge policing practices in more than 24 cities in order to protect the civil rights of the public. The Obama administration made a broad push police reform. In 2015, the Task Force for 21st Century Policing recommended restricting federal transfers of military surplus equipment, such as grenade launchers and armored vehicles, from the Defense Department to law enforcement agencies via the 1033 program. President Obama implemented the recommendations by in Executive Order 13688, in what observers saw as a bid to shift police sway from "away from creeping militarization and toward community policing." The Trump administration signaled a dramatic policy shift, with Donald Trump pledging during the campaign to reinstate the entire 1033 program. In 2017, the Trump administration announced it will reinstate the program. A member of the Wichita Falls SWAT team conducts a rifle drill. SWAT (Special Weapons and Tactics) teams are law enforcement units in the United States that use specialized or military equipment and tactics. First created in the 1960s for riot control or violent confrontations with criminals, the number and usage of SWAT teams increased in the 1980s and 1990s during the War on Drugs, and in the aftermath of the September 11 attacks. In the United States today, SWAT teams are deployed 50,000-80,000 times every year, 80% of the time in order to serve search warrants, most often for narcotics. SWAT teams are increasingly equipped with military-type hardware and are trained to deploy against threats of terrorism, for crowd control, and in situations beyond the capabilities of ordinary law enforcement, sometimes deemed "high-risk." Other countries have developed their own paramilitary police units (PPU)s that are also described as or compared to SWAT police forces. SWAT units are often equipped with specialized firearms including submachine guns, assault rifles, breaching shotguns, sniper rifles, riot control agents, and stun grenades. They have specialized equipment including heavy body armor, ballistic shields, entry tools, armored vehicles, advanced night vision optics, and motion detectors for covertly determining the positions of hostages or hostage takers, inside enclosed structures. The increased use of SWAT teams is a hallmark of increased police militarization. The Cato Institute's Radley Balko wrote that during the 1970s, there were about 300 SWAT raids a year and as of 2005 there were 40,000 a year. SWAT teams being used for gambling crackdowns and serving a search warrant are routine in some places, like Fairfax, VA."There has been a more than 1400% increase in the amount of SWAT deployments between 1980 and 2000, according to estimates ... by Eastern Kentucky University professor Peter Kraska." Balko states that in 2007, "...a Dallas SWAT team raided a Veterans [organization's] ... charity poker games. In 2010, a team of heavily armed Orange County, Florida, sheriff's deputies raided several barbershops, holding barbers and customers at gunpoint while they turned the shops inside out. Of the 37 people arrested, 34 were taken in for "barbering without a license." The Orlando barbershop raids were subsequently challenged in court, and in 2014, the U.S. Court of Appeals for the Eleventh Circuit ruled that it violated "clearly established Fourth Amendment rights" for the government to conduct "a run-of-the-mill administrative inspection as though it is a criminal raid." The ACLU has stated that "... heavily armed SWAT teams are raiding people's homes in the middle of the night, often just to search for drugs", causing people to "needlessly di[e] during these raids," in which neighborhoods are turned into "warzones". Law enforcement snipers, commonly called police snipers, and military snipers differ in many ways, including their areas of operation and tactics. A police sharpshooter is part of a police operation and usually takes part in relatively short missions. Police forces typically deploy such sharpshooters in hostage scenarios. This differs from a military sniper, who operates as part of a larger army, engaged in warfare. Sometimes as part of a SWAT team, police snipers are deployed alongside negotiators and an assault team trained for close quarters combat. As policemen, they are trained to shoot only as a last resort, when there is a direct threat to life; the police sharpshooter has a well-known rule: "Be prepared to take a life to save a life." Police snipers typically operate at much shorter ranges than military snipers, generally under 100 meters (109 yd) and sometimes even less than 50 meters (55 yd). Both types of snipers do make difficult shots under pressure, and often perform one-shot kills. Police units that are unequipped for tactical operations may rely on a specialized SWAT team, which may have a dedicated sniper. Police snipers placed in vantage points, such as high buildings, can provide security for events. In one high-profile incident, Mike Plumb, a SWAT sniper in Columbus, Ohio, prevented a suicide by shooting a revolver out of the individual's hand, leaving him unharmed. A U.S. Coast Guard TACLET marksman uses an M107 from a helicopter. The need for specialized training for police sharpshooters was made apparent in 1972 during the Munich massacre when the German police could not deploy specialized personnel or equipment during the standoff at the airport in the closing phase of the crisis, and consequently all of the Israeli hostages were killed. While the German army did have snipers in 1972, the use of snipers of the German army in the scenario was impossible due to the German constitution's explicit prohibition of the use of the military in domestic matters. This lack of police trained snipers was later addressed with the founding of the specialized police counter-terrorist unit GSG 9, which subsequently became a widely copied model for a police special forces unit. In September 2015, a San Bernardino Sheriff's Department sniper shot a suspect in a fast-moving car from a helicopter. The suspect leapt from his car and died on the side of the road, but his vehicle continued forward, striking another vehicle and critically injuring three civilians. Observers have noted the militarizing of the policing of protests. Riot police are police who are organized, deployed, trained or equipped to confront crowds, protests or riots. Riot police may be regular police who act in the role of riot police in particular situations or they may be separate units organized within or in parallel to regular police forces. Riot police are used in a variety of different situations and for a variety of different purposes. They may be employed to control riots as their name suggests, to disperse or control crowds, to maintain public order or discourage criminality, or to protect people or property. In some cases, riot police may function as a tool of political repression by violently breaking up protests and suppressing dissent or civil disobedience. A riot policeman sprays pepper spray at seated protesters during the WTO protests in Seattle in 1999. Riot police often use special equipment termed riot gear to help protect themselves and attack protesters or rioters. Riot gear typically includes personal armor, batons, riot shields and riot helmets. Many riot police teams also deploy specialized less-than-lethal weapons, such as pepper spray, tear gas, rifles that fire rubber bullets or plastic bullets, flashbang grenades, and Long Range Acoustic Devices (sound cannons). The police tactics used during the 2001 Quebec City protest serve as an example of the approaches used by North American riot police. During the protest, riot police fired tear gas canisters, water cannon, and rubber bullets, dispersing large groupings of protesters both violent and peaceful, including teach-ins and teams of medics providing first aid to other protesters. Other tactical interventions aimed at arresting various perceived movement leaders. Allegedly, "plastic bullets were being used increasingly [by riot police], and from guns with laser sights so at night people could often see that the cops were intentionally aiming for heads or groins." A Colt AR-15 Carbine with a Colt 4×20 scope. A Colt M4 Carbine with ACOG scope. The Heckler & Koch MP5, a submachine gun. The .50 BMG calibre M107 sniper rifle is almost identical to the Barrett M82 pictured here. Some U.S. SWAT teams have adopted the AR-15 carbine. Some U.S. police departments are using the M4 carbine, which will replace the M16 as the main U.S. Army combat assault rifle. "After the North Hollywood shootout in 1997, the Department of Defense gave 600 surplus M16 assault rifles to LAPD, which were issued to each patrol sergeant. Various U.S. SWAT teams are armed with the Heckler & Koch MP5, a submachine gun. U.S. law enforcement agencies such as the Coast Guard, the New York City Police Department (NYPD), and the Pittsburgh Bureau of Police (PBP) use the Barrett M82. Police use the M82 to breach barriers, because the large-calibre .50 BMG round it fires will penetrate most commercial brick walls and concrete blocks. It is an anti-materiel rifle designated as a Special Application Sniper Rifle and designed for use against military equipment (materiel), rather than against other combatants ("anti-personnel"). It is used by many armies around the world both in regular forces and in special forces units. As it uses a .50 BMG round, this has led to some debates in the U.S. armed forces about the legality of using such a large anti-materiel rifle round against a human. There have been persistent reports that some U.S. military personnel believe that the use of .50 BMG in a direct antipersonnel role is prohibited by the laws of war. However, Maj. Hays Parks states that "No treaty language exists (either generally or specifically) to support a limitation on [the use of .50 BMG] against personnel, and its widespread, longstanding use in this role suggests that such antipersonnel employment is the customary practice of nations." In October 2011, a Downey, California police officer shot an unarmed suspect named Michael Nida, who had been mistaken for an armed robber, in the back with a submachine gun, killing him. Between 2006 and 2014, almost 5,000 M16 rifles were distributed to local and state law enforcement agencies in Ohio under the surplus military equipment program. A 2017 study found a statistically significant positive relationship between militarization of the police and fatalities from officer-involved shootings. The 2015 video game Battlefield Hardline depicts a militarized police, and it depicts both police and criminals wielding military-grade equipment, including rifles, machine guns and grenade launchers. The developer's insistence on "fantasy" while meticulously recreating LA areas and loosely basing crimes in the game on real-life crimes has subsequently been criticized. The documentary Peace Officer, which is about police militarization in the U.S., won the 2015 Documentary Feature Competition Grand Jury award at the South by Southwest Film Festival. The documentary Do Not Resist by Craig Atkinson is also critical of the phenomenon of police militarization, as exemplified by law enforcement training courses taught by retired military officer Dave Grossman, who tells police officers, "You are men and women of violence." The film won the award for "Best Documentary Feature" at the Tribeca Film Festival. Balko, Radley. Rise of the Warrior Cop: The Militarization of America's Police Forces. Public Affairs, 2013. ^ "SAS - Weapons - Flash Bang | Stun Grenade (The British Army's SAS developed flashbang grenades)". Eliteukforces.info. Retrieved May 29, 2013. ^ The flash from a flashbang grenade detonation momentarily activates all photoreceptor cells in the eye, making vision impossible for approximately five seconds, until the eye restores itself to its normal, unstimulated state. The loud blast is meant to cause temporary loss of hearing, and also disturbs the fluid in the ear, causing loss of balance. The concussive blast of the detonation can still injure, and the heat created can ignite flammable materials. ^ Texas Rangers, Department of Public Safety, Branch Davidian Evidence, Investigative Report No. 1, September 1999; Investigative Report No. 2, January 2000 (PDFs available at Texas Rangers website). The Rangers found that the FBI used grenade launchers to fire two 40 mm M651 grenades. The Army considers the M651 a pyrotechnic device and that it is known to cause fires. The Army Tech Manual for the M651 warns that it can penetrate 3/4" plywood at 200 meters and "projectile may explode upon target impact." During inventory of the Waco evidence the Texas Rangers also found flashbang grenades. ^ James Joyner (June 15, 2011). "Militarization of Police". Outside the Beltway. ^ Paul D. Shinkman (August 14, 2014). "Ferguson and the Militarization of Police". U.S. News and World Report. ^ Michael German (December 18, 2014). "Why Police Spying On Americans Is Everyone's Problem". Defense One. ^ Josh Peterson (March 25, 2014). "State lawmakers push to rein in police spying". Fox News Channel. ^ Ryan Van Velzer (June 24, 2014). "ACLU: Free military weapons making Arizona police more aggressive". The Arizona Republic. ^ Jodie Gummow (August 29, 2013). "11 over-the-top U.S. police raids that victimized innocents". Salon. ^ GLENN GREENWALD (August 14, 2014). "THE MILITARIZATION OF U.S. POLICE: FINALLY DRAGGED INTO THE LIGHT BY THE HORRORS OF FERGUSON". The Intercept. ^ a b "Crisis and Control". uchicago.edu. ^ a b "Congress scrutinizes police militarization before planned Ferguson protest". aljazeera.com. ^ http://dictionary.reference.com/browse/plastic+bullet "A solid PVC cylinder, 10 cm long and 38 mm in diameter, fired by police or military forces to regain control in riots." ^ Ryan Welch and Jack Mewhirter (June 30, 2017). "Does military equipment lead police officers to be more violent? We did the research". The Washington Post. ^ Michael Spratt (August 15, 2014). "The creeping militarization of the police". iPolitics. ^ Douglas Quan (August 21, 2014). "'We call it a rescue vehicle': Growing number of Canadian police forces bulking up with armoured vehicles". National Post. ^ "Canadian Police Militarization". Michael Spratt. ^ "Canadian police agencies: Innovators in militarization?". rabble.ca. ^ Ashley Csanady (August 15, 2014). "Police militarization is already in Canada as surveillance on the rise". Canada.com. ^ "Police Militarization: Similarities Between Ferguson and Brazil". wola.org. ^ "Legislação". www.coter.eb.mil.br (in Portuguese). Archived from the original on 2016-03-17. Retrieved 2017-03-19. ^ a b "Despite Current Debate, Police Militarisation Goes Beyond U.S. Borders". ipsnews.net. ^ a b c d (www.dw.com), Deutsche Welle. "Germany's new anti-terror units: A paramilitary excess? - Germany - DW - 28.01.2016". DW.COM. ^ Maureen Meyer (March 13, 2013). "Mexico's New Military Police Force: The Continued Militarization of Public Security in Mexico". Washington Office on Latin America. ^ "The Militarization of Police at Home and Abroad". american.edu. ^ "Domestic Operational Law: The Posse Comitatus Act and Homeland Security". army.mil. ^ "The Posse Comitatus Act: Liberation from the Lawyers" (PDF). army.mil. ^ "Police armored vehicles have long history". kansascity. ^ "History of Department". Kenosha Police Department. ^ Miller, Wilbur R. (2012). The Social History of Crime and Punishment in America: An Encyclopedia. SAGE. p. 1230. ISBN 9781412988766. Retrieved 19 April 2017. ^ Aaron Morrison (May 18, 2015). "Police Militarization History Stretches Back To Civil Rights Movement [PHOTOS]". International Business Times. ^ Joy Rohde (August 7, 2016). "Police militarization is a relic of Cold War paranoia". Business Insider. ^ Clark, J (2000). "Training SWAT teams: Implications for improving tactical units". Journal of Criminal Justice. 28 (5): 407–413. doi:10.1016/S0047-2352(00)00055-6. ^ Abraham, Kera (November 22, 2006). "Flames of Dissent". Eugene Weekly. Retrieved June 10, 2007. ^ "Earth Liberation Front arsonist sentenced to 13 years". The Seattle Times. May 24, 2007. ^ Falcone, David N.; Wells, Edward L.; Weisheit, Ralph A. (2002). "The Small-Town Police Department". Policing. 25 (2): 371–85. doi:10.1108/13639510210429419. ^ Gregory, Anthony (2014). "Rise of the Warrior Cop: The Militarization of America's Police Forces". The Independent Review. 19 (2): 271–75. ^ Kraska, Peter B (1999). "Militarizing Criminal Justice: Exploring the Possibilities". The Journal of Political and Military Sociology. 27 (2): 205–15. ^ Kohn, Richard H (2008). "The Danger of Militarization in an Endless 'War' on Terrorism". The Journal of Military History. 73 (1): 177–208. doi:10.1353/jmh.0.0216. ^ a b Balko, Radley (September 11, 2011). "A Decade After 9/11, Police Departments Are Increasingly Militarized". The Huffington Post. Retrieved November 29, 2014. ^ LAPD gets M16s; LAPD museum showcases department's good, bad, ugly. ^ "LAPD Swat". Shootingtimes.com. Retrieved January 17, 2015. ^ "The Law Enforcement Support Office". Defense Logistics Agency. United States Government. Archived from the original on December 9, 2014. Retrieved August 16, 2014. ^ "Uncle Sam Asks: "What the hell is going on here?" in New ACLU Print and Radio Advertisements" (Press release). American Civil Liberties Union. September 10, 2003. ^ "ACLU Ad On "Sneak-and-Peek" Searches: Overblown". FactCheck.org. September 21, 2004. Archived from the original on July 14, 2007. ^ Colleen Curry (May 18, 2015). "The Military Equipment Gravy Train Is Ending for Local Police Departments". Vice. ^ a b c d "Police union accuses White House of politicizing cop safety". POLITICO. ^ "Administration's One-Year Experimentation With Reining In Police Militarization Apparently Over". TechDirt. 2016-07-22. Retrieved 2016-07-30. ^ Ryan Lucas (August 28, 2017). "Trump Administration Lifts Limits On Military Hardware For Police". NPR. ^ Emily Tillett (August 28, 2017). "Sessions announces end to Obama-era ban on surplus military equipment for police". CBS News. ^ a b Balko, Radley (10 September 2015). "Once again: There is no 'war on cops.' And those who claim otherwise are playing a dangerous game". Archived from the original on 2015-11-05 – via washingtonpost.com. ^ Shapiro, Michael J (June 17, 2010). The Time of the City: Politics, Philosophy and Genre. Routledge. p. 108. ISBN 9781136977879. ^ Martha T. Moore (May 11, 2005). "1985 bombing in Philadelphia still unsettled". USA Today. ^ Stevens, William K. (14 May 1985). "Police Drop Bomb on Radicals' Home in Philadelphia". New York Times. ^ Frank Trippett (June 24, 2001). "It Looks Just Like a War Zone". TIME. ^ "25 Years Ago: Philadelphia Police Bombs MOVE Headquarters Killing 11, Destroying 65 Homes". Democracy Now!. May 13, 2010. ^ WILLIAM K. STEVENS (May 4, 1988). "Grand Jury Clears Everyone In Fatal Philadelphia Siege". New York Times. ^ "Philadelphia MOVE Bombing Still Haunts Survivors". NPR. Retrieved 2013-05-14. 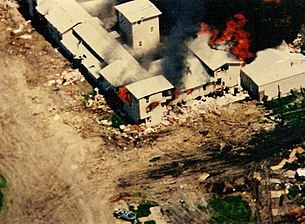 ^ "What Really Happened At Waco". 60 Minutes/CBS News. January 25, 2000. ^ "Development and History of the M60 tank: M728 CEV". Patton Mania. Retrieved June 21, 2011. ^ Texas Rangers, Department of Public Safety, Branch Davidian Evidence, Investigative Report No. 1, September 1999; Investigative Report No. 2, January 2000 (PDFs available at Texas Rangers website). The Army considers the M651 a pyrotechnic device and that it is known to cause fires. ^ Lisa Rein (October 8, 2008). "Md. Police Put Activists' Names On Terror Lists". The Washington Post. Archived from the original on 2010-03-05. ^ James Ridgeway (August 28, 2009). "The Secret History of Hurricane Katrina". Mother Jones. ^ "Denver settles suit linked to 2008 Democratic National Convention". The Denver Post. August 16, 2011. Archived from the original on 2018-02-14. ^ a b Hennessey, Virginia (August 19, 2013). "Monterey County agrees to pay $2.6 million in 'flash-bang' death of Greenfield man". Monterey Herald. Retrieved February 27, 2014. ^ Axe, David (30 May 2011). "Drug Raid Turns Ugly as SWAT guns down Marine vet". Wired.com. Archived from the original on 2011-06-01. One thing is clear. With military-grade vehicles, armor, assault weapons and robots, the raid on Guerena's home was all but indistinguishable from the kind of house-clearing operations U.S. forces perform every day in Iraq and Afghanistan. Guerena survived two tours in the desert only to perish in a military-style action in his own home. ^ Balko, Radley (26 September 2013). "Family Of Jose Guerena, Former Marine Killed By SWAT Team, To Receive $3.4 Million". Huffington Post. Archived from the original on 2013-09-30. Retrieved 11 May 2017. ^ Chuck Conder (27 May 2011). "Marine Never Fired On SWAT Officers Who Fatally Shot Him". CNN. Archived from the original on 2011-09-17. ^ Ellen Tumposky (27 May 2011). "Drug SWAT Team That Gunned Down Ex-Marine Found No Drugs". ABC News. Archived from the original on 2011-05-28. But protests in the community continue. Guerena's widow will join members of the Oathkeepers, a group of veterans and law-enforcement officials, for a Memorial Day rally Monday at the Guerena home . The Oathkeepers say on their website that they are determined "to take a stand against the egregious policy of using SWAT teams to serve search warrants on veterans and gun owners with no violent criminal history. ^ Amity Paye (April 15, 2014). "Did Occupy Actually Make Police Departments More Accountable?". The Nation. ^ "Toddler critically injured by 'flash bang' during police search". May 29, 2014. Retrieved May 30, 2014. ^ Apuzzo, Matt (June 8, 2014). "War Gear Flows to Police Departments". The New York Times. Retrieved December 13, 2014. ^ "Community Police Armed with the Weapons and Tactics of War". ACLU. Retrieved June 8, 2014. ^ "Cash Flowed To Lawmakers Who Voted to 'Militarize' Police". International Business Times. August 15, 2014. Retrieved December 13, 2014. ^ "Amid Ferguson chaos, Rand Paul bemoans 'militarization' of police". Los Angeles Times. August 14, 2014. Retrieved December 13, 2014. ^ Karl Bickel (December 2013). "Will the Growing Militarization of Our Police Doom Community Policing?". Daily Dispatch. Community Oriented Policing Services, US Dept of Justice. 6 (12). Retrieved January 28, 2015. ^ Karl Bickel, Will the Growing Militarization of Our Police Doom Community Policing?, Community Policing Dispatch, Department of Justice's Office of Community Oriented Policing Services (Vol. 6, Issue 12), December 2013. ^ a b "War Comes Home: The Excessive Militarization of American Policing". American Civil Liberties Union. Retrieved January 17, 2015. ^ "A New Christmas Truce". The Huffington Post. n.d. Retrieved January 17, 2015. ^ "What Have We Become?". The Huffington Post. n.d. Retrieved January 17, 2015. ^ "Militarization Of Campus Police". The Huffington Post. ^ "Aug 20 - Database Shows What Military Equipment Your Local Police Department Has Been Stockpiling". boxden.com. ^ Bruce, Becky. "Fraternal Order of Police defends 'militarization'". KSL TV. Retrieved February 13, 2015. ^ Daniel Rivero (March 23, 2015). "The new DOJ report on Philadelphia police shootings is mandatory reading". Fusion. ^ SEAN CARLIN & MICHAEL R. SISAK (March 23, 2015). "Deadly force report cites Philadelphia cops' poor training". San Antonio Express News. ^ Yamiche Alcindor (June 18, 2015). "Amnesty: U.S. doesn't meet international standards for deadly police force". USA Today. ^ Adam Bates, Policy Analysis No. 809, Stingray: A New Frontier in Police Surveillance, Cato Institute (January 25, 2017). ^ "POLICING FREE SPEECH: Police Surveillance and Obstruction of First Amendment-Protected Activity" (PDF). American Civil Liberties Union. June 29, 2010. ^ a b Matthew Carlton Hammond, The Posse Comitatus Act: A Principle in Need of Renewal, Washington University Law Review, Vol. 75, issue 2 (January 1997). ^ a b David B. Kopel & Joseph Olson, Preventing a Reign of Terror: Civil Liberties Implications of Terrorism Legislation, 21 Oklahoma City University Law Review 247 (summer/fall 1996). ^ Charles J. Dunlap, Jr., The Police-ization of the Military, Journal of Political and Military Sociology Vol. 27 (Winter 1999), pp. 217-232. ^ Abigail R. Hall & Christoper J. Coyne, The Militarization of U.S. Domestic Policing, Independent Review: A Journal of Political Economy, vol. 17, no. 4 (spring 2013). ^ a b Donald J. Campbell & Kathleen M. Campbell, Soldiers as Police Officers/Police Officers as Soldiers: Role Evolution and Revolution in the United States, Armed Forces & Society 36(2), pp. 347-48 (January 2010). ^ a b "War Comes Home: The Excessive Militarization of American Policing" (PDF). American Civil Liberties Union. June 2014. ^ Ilya Shapiro and Randal John Meyer (September 16, 2015). "Police Militarization Leads to Extreme Constitutional Violations". Cato Institute. ^ a b Josh Sanburn, This Is Why Your Local Police Department Might Have a Tank, Time (June 24, 2014). ^ a b c d Ed Pilkington, US police departments are increasingly militarised, finds report, The Guardian (June 24, 2014). ^ Paramilitary police: Cops or soldiers? America's police have become too militarised, The Economist (March 14, 2014). ^ Simon Davis-Cohen, Footage of the Largest Gang Raid in NYPD History Reveals the Agency’s Military-Style Tactics, The Nation (September 1, 2016). ^ Rob Ferrett, Police Use of Military-Style Tactics Can Be Recipe For Trouble, Journalist Says, Wisconsin Public Radio (August 1, 2013). ^ Spencer Ackerman (February 24, 2015). "The disappeared: Chicago police detain Americans at abuse-laden 'black site'". The Guardian. ^ a b Jaweed Kaleem (February 5, 2017). "Under Obama, the Justice Department aggressively pursued police reforms. Will it continue under Trump?". Los Angeles Times. ^ a b c d Tess Owen, Donald Trump and his intended attorney general signal a dramatic shift for reforms, VICE News (December 5, 2016). ^ Executive Order 13688: Federal Support for Local Law Enforcement Equipment Acquisition (January 16, 2015). ^ Police expect more surplus military gear under President Trump, Associated Press (December 11, 2016). ^ "Trump to Fully Restore Military Surplus Transfers to Police". The New York Times. 27 August 2017. Retrieved 29 August 2017. ^ Swaine, Jon; Holpuch, Amanda (August 14, 2014). "Ferguson police: a stark illustration of newly militarised US law enforcement". The Guardian. Retrieved April 26, 2015. ^ Radley Balko, Federal appeals court: Stop using SWAT-style raids for regulatory inspections, Washington Post (September 19, 2014). ^ "The Sniper, SWAT Teams Grow In Number". CBS News. January 25, 2001. Retrieved May 4, 2008. ^ "Police sniper watches from roof, Sydney". Australian Broadcasting Corporation. September 6, 2007. Retrieved May 4, 2008. ^ "Suspect Dies After Deputy Opens Fire From Helicopter Along 215 Freeway". CBS Los Angeles. September 18, 2015. ^ Graeber, David (2009). Direct Action: An Ethnography. AK Press. p. 185. ISBN 978-190485979-6. ^ "Free Jaggi Singh". Rabble.ca. Retrieved May 12, 2015. ^ Graeber, David (2009). Direct Action: An Ethnography. AK Press. p. 178. ISBN 978-190485979-6. ^ Parks, Maj W. Hays (January 1988). "Killing A Myth". Marine Corps Gazette. Retrieved February 20, 2014. ^ Staff writers (October 24, 2012). "No charges against Downey officer who shot unarmed man, D.A. says". Los Angeles Times. Retrieved June 29, 2016. ^ Rich Exner (August 20, 2014). "Defense Department issues Ohio police 5,000 M16 rifles, other supplies under surplus program". Cleveland.com. ^ Delehanty, Casey; Mewhirter, Jack; Welch, Ryan; Wilks, Jason (2017-04-01). "Militarization and police violence: The case of the 1033 program". Research & Politics. 4 (2): 2053168017712885. doi:10.1177/2053168017712885. ISSN 2053-1680. ^ "Analysis | Does military equipment lead police officers to be more violent? We did the research". Washington Post. Retrieved 2017-06-30. ^ "Battlefield Hardline Review: Cop Out". Paste. ^ Luke Plunkett. "Soldier Cops Aren't So Fun Now, Video Games". Kotaku. ^ Nathan Grayson. "Why 2014's Battlefield Is 'Just Avoiding' Uncomfortable Topics". TMI. ^ Karen Foshay (March 19, 2015). "When the SWAT team you founded kills your son-in-law". Al Jazeera. ^ Matt Donnelly (March 17, 2015). "SXSW 2015: 'Krisha,' 'Peace Officer' Top Film Festival Jury and Special Awards". The Wrap. ^ Stuart Miller (September 30, 2016). "Do Not Resist: new film shows how US police have become an occupying army". The Guardian. ^ Radley Balko (September 30, 2016). "'Do Not Resist': A chilling look at the normalization of warrior cops". The Washington Post. This page was last edited on 26 March 2019, at 15:16 (UTC).